I put very little stock in preseason performances. The minuscule sample size and vanilla scheming leads to a ton of irrelevant noise and dangerous swings in player perception. Exhibit A is Ameer Abdullah’s 45-yard run in August of 2015, a play which boosted his perceived value for literal years after it happened. However, I do use the preseason to get a handle on how coaches view their depth charts. The easiest way to do this is by not following what they say, but instead watching how they use players. By tracking first-string usage, we quietly can learn a ton as we continue to get set for Week 1. Meanwhile, the “preseason is meaningless crowd” will fall behind. These are the usage notes I found most important through two weeks of preseason action. In the first preseason game, Doyle ran a pass route on 11 of Andrew Luck’s 12 dropbacks. His usage was enticing once again Monday night, as he was in on 21 of Luck’s 23 snaps and got three targets on 13 pass attempts. Meanwhile, Ebron was only in on five of Luck’s 23 snaps. Doyle is clearly the top tight end on a team severely lacking respectable options in the run game and at No. 2 wideout. 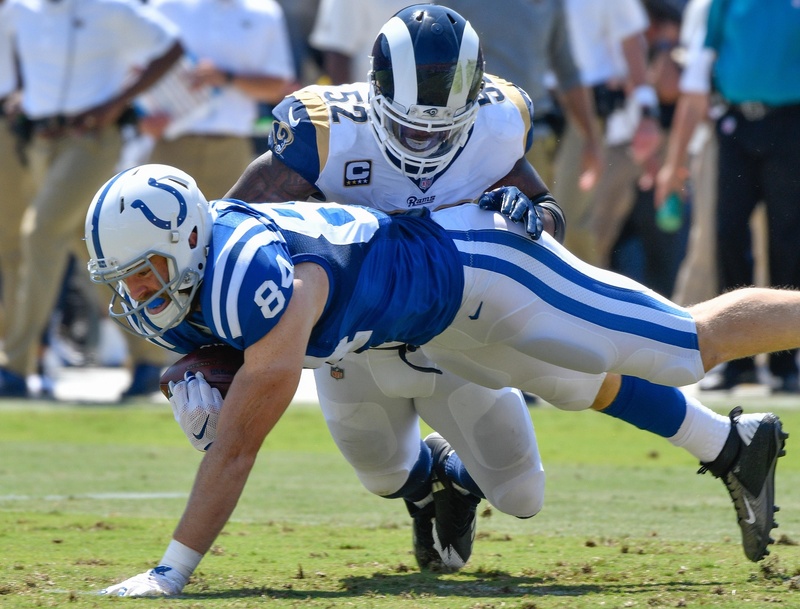 Luck also has a long history of targeting his tight ends, as Dwayne Allen, Coby Fleener and Doyle can attest. Jordan Reed is shaping up as the best tight end play at $4,000 in Week 1, but Doyle at $3,600 can’t be ignored. Before we go nuts on this one, be aware the Lions use three wide receivers as a base formation. They have used this formation 84 percent of the time when passing over the past two seasons (most in NFL), via Graham Barfield. But I still thought it was interesting that Golladay ran ahead of veteran Golden Tate in 2-WR sets Friday. 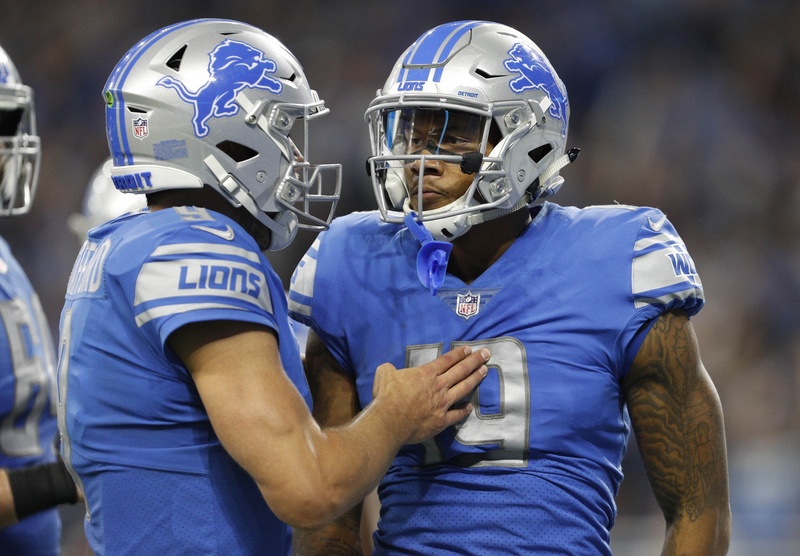 Jones played 13 snaps, Golladay 12 and Tate seven on Matthew Stafford’s 13 snaps. At the very least, it’s a sign OC Jim Bob Cooter wants to put more on Golladay’s plate this season after the impressive athlete had just 28 catches despite running 317 routes as a rookie last season. I’d be somewhat neutral on Tate in season-long right now and excited to take a shot on Golladay. This article from beat man Kyle Meinke gives a bit more context on the situation. I do not think Taylor is behind Tajae Sharpe or Nick Williams on Tennessee’s wide receiver depth chart. Perhaps he was being punished for something or maybe the coaches simply wanted a look at those backups with the first-stringers. But we still need to be aware that Taylor was in on only an eye-opening one of Marcus Mariota’s 12 snaps Saturday. Yes, he took a screen pass on that one snap for an electric 47-yard touchdown. 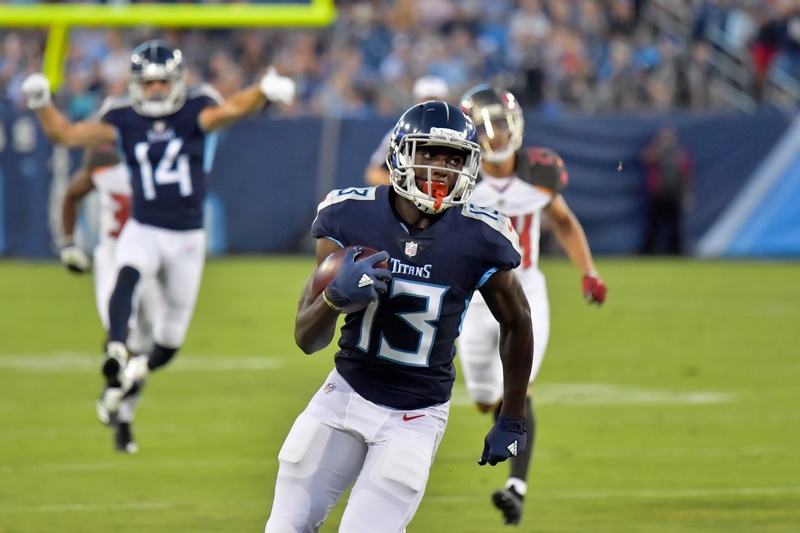 But the overall wideout snaps with Mariota were Corey Davis 12, Tajae Sharpe 10, Nick Williams 8, Taylor 1. Note that likely starter Rishard Matthews (undisclosed) sat out once again. The third preseason game should tell us a lot more. I fully expect the extremely talented Taylor to be back ahead of Sharpe and Williams and stay there through Week 1. But with Matthews possibly back and Davis entrenched as the No. 1, I’m feeling a bit more uneasy about Taylor as a safe Week 1 play, even at just $3,600 in a good matchup at Miami. The Browns’ first-stringers have played 32 snaps this preseason, and Hyde has been the clear-cut starter. He’s been in on 19 snaps compared to 13 for Duke Johnson and zero for Nick Chubb. Hyde has flown under the radar in season-long formats due to all the competition, but he did get a three-year, $15 million contract with $8 million guaranteed this offseason and appears locked into the Isaiah Crowell role. 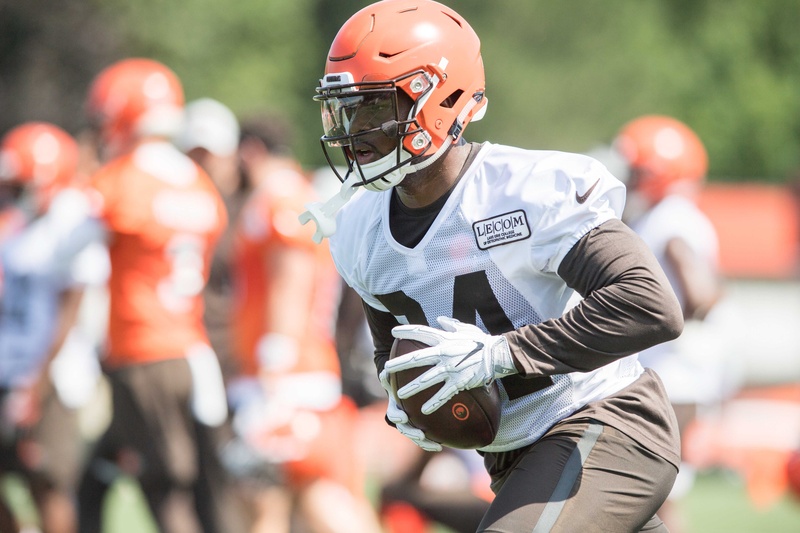 Crowell picked up 206 carries, 42 targets and 14 of the Browns’ 20 rushing attempts from inside the 10-yard line last season. 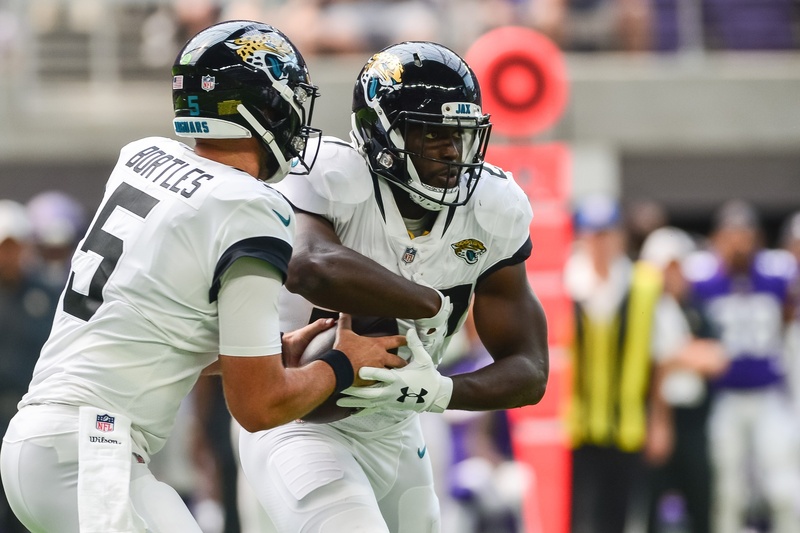 We know Fournette is going to get a massive workload this season as the Jags continue their goal of winning with defense while hiding Blake Bortles. Fournette averaged 20.6 carries per game as a rookie and tacked on 3.7 targets. The last hurdle for him to clear was becoming game-flow independent, playing on third-and-long and playing in the two-minute offense. I’m still not sure Fournette is there yet, but the Jags clearly are experimenting with it more, as he was in on all six third-down plays the first-stringers ran Saturday. Overall, he was in on 23-of-29 first-string snaps while T.J. Yeldon got seven and Corey Grant got zero. Proving to be a capable pass-catcher, Fournette is someone I’m warming to lately. It certainly helps his out-of-division schedule includes the Giants, Jets, Cowboys, Bills, Redskins and Dolphins. Jones has been in on just 3-of-34 first-team snaps for the Bucs so far this preseason. Overall he’s rushed 12 times for 11 yards and dropped two targets. Meanwhile, Barber has been in on 25 of those 34 first-team snaps and is entrenched as the feature back. After the second preseason game, head coach Dirk Koetter said “I think if we went out there and gave it to Peyton 20 times, we’d like what he does. But we’re not going to do that in a preseason game.” Barber is shaping up as a 15+-touch candidate at $4,100 in Week 1 at New Orleans. The Jags have a deep wideout corps that has been difficult to get a handle on all offseason. They oddly paid Donte Moncrief a pile of cash, Dede Westbrook and DJ Chark have been standing out at camp and Marqise Lee is the incumbent No. 1. But we got a glimpse of their plans Saturday, as the starters played 29 snaps and Cole was on the field for 22 of them. Lee was next up with 21, then Westbrook (13), Moncrief (6) and Chark (5). Beat reporters have since confirmed Cole and Lee have been running with the first-stringers in practices, so this one seems likely to stick. Remember that Cole showed a big ceiling last year after injuries rocked the Jags’ wideout corps, going 19-442-3 in the four games between Weeks 13 and 16. Cole is just $3,800 in Week 1 against the Giants while Lee is $4,900. I’ve talked extensively about Njoku already, just last week in this space as well as in New Starters. But it’s worth emphasizing how much his role is set to change. Last year Njoku was in on only 47 percent of the snaps, and so far this preseason, he’s been in on 94 percent of the first-string snaps. There’s a lot of competition for targets in Cleveland with Josh Gordon returning to join Jarvis Landry, Duke Johnson and Rashard Higgins. But Njoku is a special talent with a lot of upside for someone priced at just $3,400 in Week 1. Brown always has been long on talent and short on health, mostly due to his battles with the sickle-cell trait. But he appears healthy right now, as he’s been the unquestioned star of Ravens training camp and easily has leapt into a starting role. Joe Flacco played 17 snaps Monday night, and Brown was on the field for a WR-high 15 of them. Michael Crabtree was next with 13, followed by slot man Willie Snead (13) and Chris Moore (3). Note that Joe Flacco was seventh in pass attempts last season and second in 2016. I led last week’s version of this article with McCaffrey after he was in on 14-of-14 first-team snaps in the preseason opener, getting four carries (including a goal-line TD) and two targets. In the second preseason game, CMC kept his foot on the gas by getting the first nine RB touches, ripping off a 71-yard TD run and piling up five carries plus four catches on his 17 snaps. At this point, we have to take the Panthers’ claims they want McCaffrey to touch the ball 20+ times a game seriously. Even if he gets just 60 percent of the running back carries plus his usual pass-game work, he’ll be one of Week 1’s best values at $6,400 against the Cowboys. I discussed this with Drew Dinkmeyer on this week’s DFS Edge pod. Mitchell Trubisky played 29 snaps Saturday and Jordan Howard was on the field for 21 of them. That included three of the six third-down plays. So there was little left for Cohen, who only got eight snaps. This is reminiscent of last preseason, when the Bears purposefully didn’t use Cohen in the preseason because they wanted to surprise the Falcons with him in Week 1. The pint-sized playmaker ended up with 5-66-0 rushing and 8-47-1 receiving in that game. Of course, the Bears have an entirely new coaching staff, and it remains unclear how big of a role they foresee for the 5-foot-6 Cohen. Right now, it’s a strict specialty role with a share of the pass downs. There have been whispers Cam Meredith or Tre’Quan Smith could overtake the 33-year-old Ginn for the role opposite Michael Thomas this season. That doesn’t appear likely, at least to start the season. Ginn was on the field for 11 of the first 13 plays the Saints ran Friday, while Meredith got four and Smith got zero. Meredith had a bad drop that led to an interception and still appears to be struggling with his ACL rehab. But Smith has shined, going 7-108-0 on nine targets in the preseason so far. Ginn’s deep-threat role is intact, but I wouldn’t be surprised if the role of Meredith (if healthy) and Smith rise later in the season. It’s becoming increasingly clear that rookie Christian Kirk is the second-best wideout on the Cardinals’ roster. However, that might not be enough because Kirk exclusively has played the slot, where he was in college. That’s tough because Fitzgerald is the unquestioned slot man for this team and won’t be usurped this season. So Kirk got zero first-team snaps Friday, playing behind outside receivers Greg Little and Chad Williams as Brice Butler (foot) sat. Once Fitz took a rest for the night, Kirk came on and shined. Tight end historically has been the most difficult position for rookies to post production at. So perhaps we shouldn’t be too surprised that Gesicki has zero catches on 42 snaps and 24 routes run so far. The good news is he’s started both games, and it appears the Dolphins are committed to going with him as their No. 1. Gesicki is too good of an athlete to not fall into production at some point down the line. I’ve seen some buzz on Hooper because he has 3-38-1 in limited action this preseason. But I’m not sure I see a role change for him this year, and the Falcons used a first-round pick on Calvin Ridley. Hooper has been in on 14-of-19 first-team snaps (73 percent) so far this preseason, similar to last regular season, when he played on 77 percent of the snaps and ran 404 routes but saw just 65 targets. It’s tough to suddenly see Hooper becoming featured in an offense with Julio Jones, Ridley, Mo Sanu, Devonta Freeman and Tevin Coleman. Tom Brady surprisingly played 35 snaps Thursday, and Hogan led all wideouts with 29 snaps — and that was with suspended Julian Edelman getting 27 snaps of his own. Hogan was used all over the field and caught a red-zone touchdown, finishing with a 5-25-1 line. This will do nothing to douse his white-hot stock in fantasy circles or check his ownership in Week 1 at Houston, even at a somewhat appropriate $6,100 tag. McCaffrey is the talk of the fantasy world, the Panthers used a first-round pick on DJ Moore and 33-year-old Greg Olsen (foot) looks shockingly healthy. So I get that no one is excited about Funchess. Still, he’s been in on all 38 of Cam Newton’s snaps this preseason and is priced at just $5,200 in Week 1. Armed with a red-zone skill set, Funchess has 17 touchdowns in his three-year career despite only being a full-time player in one of those seasons. As noted by Graham Barfield, Laquon Treadwell has been running as an outside receiver in the Vikings’ 3-WR package this offseason. That’s pushed Thielen into the coveted big slot role, one I discussed with Matt Harmon on Episode 202 of The Edge. Thielen has run 77 percent of his routes from the slot this preseason after being down at 51 percent last regular season. Stefon Diggs and Thielen remain two primary season-long targets and are viable Week 1 DK options in a tasty home matchup against the 49ers. Sharp fantasy owners have been salivating over Burton ever since he signed a $32 million free agent contract with the Bears. This preseason has done nothing to slow that hype down, as Burton undoubtedly is playing the “F” role in Matt Nagy’s offense — the same one Travis Kelce dominated in for the Chiefs. Through two weeks Burton has been in on 34-of-39 first-team snaps (87 percent) and been targeted on six of Trubisky’s 18 pass attempts. Burton, often split off the line a la Kelce, has cashed that usage in to the tune of 5-50-1 on just 20 pass routes run. Miller lost a lot of playing time to Alfred Blue late last season and was supposed to face stiff competition from D’Onta Foreman this training camp. Well, Foreman (Achilles) remains sidelined and Blue isn’t putting any heat on. Miller has been on the field for all 16 of Deshaun Watson’s preseason snaps this season, highlighting the staff’s seemingly newfound trust. Remember, Miller averaged 14.9 fantasy points per game with Watson healthy last season vs. 9.9 without Watson.